Rise of Neo-Babylonian Empire started at the same time when the Neo-Assyrian Empire began to decline. Babylonia under King Nabopolassar of Chaldea rebelled drive out the Assyrians after death of Ashurbanipal in 626 BC. Nabopolassar managed to unite various Aramaean tribes under his authority and was proclaimed king of Babylon in 626 BC. In alliance with Medes Nabopolassar destroyed the Neo-Assyrian Empire and conquered Nineveh, while Babylonia became the leading power in the Middle East once again. The Medes after the fall of Nineveh in 612 BC occupied Assyrian territory to upper and middle course of Tigris River, while Nabopolassar took the city of Harran which provoked conflict with his former allies the Medes. At the end of his reign Nabopolassar left over military campaigns and government to his eldest son Nebuchadrezzar II who was named his successor. Military campaign in Syria brought Babylonia into conflict with Egypt but Nebuchadrezzar II defeated the Egyptians in the Battle of Carchemish in 605 BC and won large part of Syria and Palestine for Babylonia. Since he was already named an heir to the Babylonia throne Nebuchadrezzar II ascended to the throne without any difficulties when his father died in 605 BC. Nebuchadrezzar II is probably best known for suppressing the Jewish rebellion in 597 BC and conquest of Kingdom of Judah and Jerusalem. He destroyed the temple and deported thousands of Jews to Babylon what became known as the so-called Babylonian captivity or Babylonian exile. Besides for his successful military campaigns which extended Babylonian territory to the Egyptian border Nebuchadrezzar II is also renowned for his building activities. 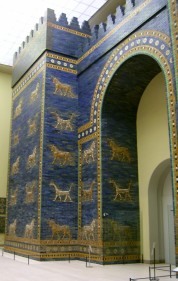 He fortified the walls of Babylon adding a third outer defensive wall as well as the famous Ishtar Gate, rebuilt the palace and ordered construction of other public buildings, completed the Tower of Babel and built the Hanging Gardens of Babylon - one of the original Seven Wonder of the World. The Neo-Babylonian Empire reached its zenith during the reign of Nebuchadrezzar II (605-562 BC). He was succeeded by his son Awil-Marduk (562-560 BC) who failed to win the support of the priests of Marduk and was overthrown. Awil-Marduk was succeeded by two usurpers Neriglissar (562-558 BC) and Nabonidus (558-539 BC). Latter was a son of priestess of the god Sin in Harran what probably resulted in the internal turmoils and his retreat from Babylon to Taima, a large oasis in northern Arabia about 552 BC. Neo-Babylonian Empire was at the time greatly endangered by the rising power of the Persians under Cyrus the Great who conquered Babylonia in 539 BC.